Welcome to a new year of Lightning Readers! Sylvie opened the St Kilda club with how we run Lightning Readers, and this year Lola is the 'juice fairy', Zoe is the 'chip elf', and Olivia is the 'freddo frog nymph'! Two jobs which change from week to week are the 'chooser' (order of reviewing), and the 'timekeeper' (5 minutes allocated per person, or 7 minutes for a joint presentation). I read the original one, lots of fancy words - really good. It’s about a man called Jonathan Harker, who goes to Dracula’s castle. It starts with a diary, and it’s all about what happens at Dracula’s castle. There are vampire ladies, it’s pretty hard to explain. Tris lives in Abnegation. She is 16 and it is her Choosing Day. She will decide where she will live by taking an aptitude test. Her test is inconclusive. She is a Divergent. She qualifies as Dauntless and Erudite. To other people this is dangerous so she can’t tell anyone. She chooses Dauntless where she does very badly at the start, then she is skyrocketing, doing really well. There is a bit of romance between her and one of the instructors, called Four. She goes into 'stimulation' where she shows her fears. It’s about a girl who is Dutch and lives in Holland and is Jewish at the start of World War 2. She is pretty insecure and doesn’t think she has any true friends. When the Nazis come she goes into hiding with a German family. It is written in diary form which is a really different way of reading. It’s about a boy called Joshua Dread. He finds out he has a superpower, 'spontaneous combustion'. He gets invited to go to ‘Gyfted & Talented’, a school where those with superpowers go to train with Captain Justice who is a world famous superhero. There is also a superhero who designs the best uniforms in the world. Joshua’s friend Sophie is also a superhero with super strength who glows brightly – she is called Firefly. They fight the Multiplier. Very, very good! Vampire Academy has vampires, but they don’t call themselves vampires, they are known as the Moroi. They are a type of vampire but there are other vampires called Strigoi and they are evil. Then there are the Dhampir, who protect the Moroi from the Strigoi. The Dhampir are a cross-breed of human and Moroi but weirdly enough they can’t have kids with each other. They are quite a complicated race. The 2 main people are Rose Hathaway and Vasilisa Dragomir, she likes to be called Lissa. They are BFFEAE (best friends forever and ever). Lissa can do things. All the Moroi have a power – air, water, fire, earth – or quite rarely get a spirit. Really well written, describes everything really well. Great use of words, twists and turns in the plot. Really good. I found it in the Remote Bookshop in Aireys Inlet. It’s about Charlie. Way back in the past there was a magician king who had 10 children, and each one of them got one of his powers, descending down to Charlie along with a few other people. The king was called the Red King. Charlie’s power is that he can hear what is going on in pictures and sometimes he can go into them. People with powers go to Bloor's Academy. There are 2 families with direct descent from the Red King - the bloor's and the Yewbeam's. Charlie is from the Yewbeam's. Both the Bloor's and the Yewbeam's are really bad most of the time. They do bad things. Dr. Bloor's son Manfred is a hypnotist. Really good. Jenny Nimmo is good at coming up with problems. It’s about this kid called Greg, and his brother Roderick. He goes on a really long road trip. At the beginning he says ‘you have no control over your life’ because his mom springs this road trip on him. He ends up sitting in the back, sitting with all the baggage. This is the first one I read, now I’ve read about 5. This is about 2 best friends, Ivy & Bean. They make an oath, they promise to tell each other secrets for the rest of their lives. They make the promise with spit. Ivy tells Bean a secret. “This morning I went into the bathroom and found this cold mist around me and my teeth started chattering. 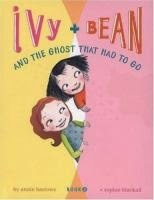 There was a ghost in my bathroom!” Bean blurts out Ivy’s secret to their friend ZuZu. Ivy is sad. Bean says there's a potion to make the ghost go. It’s about a boy called Leo and his cousin Mimi. They find a very precious music box. Mimi takes one piece of jewellery out of it and they discover that if you only turn it 3 times the music box comes to life. They find this is a key. The music box has a life. In the second book they go back into Rondo, Conker rushes them around. A wizard has disappeared and they go on a quest. They are just investigating Officer Begood. They found a guy in a mushroom form trying to squeeze out a window. They are trying to figure out a way to get him to talk.